Trying to describe sour beer to someone who’s never had one before can feel a bit like crawling through mud. In terms of flavor, comparisons to wine and cider can sometimes work, with an emphasis on the beer’s amped-up acidity. But as the range of sour beers continues to expand, it’s not just newcomers who are trying to understand what makes a sour, well, sour. American brewers everywhere are making acidic beers of all colors and ABVs, stretching with each fruit and yeast strain to achieve that piquant ping we’ve come to know and love from the style. And that experimentation means that when it comes to the technical nitty-gritty of what makes a sour beer sour, the conversation can quickly stall. 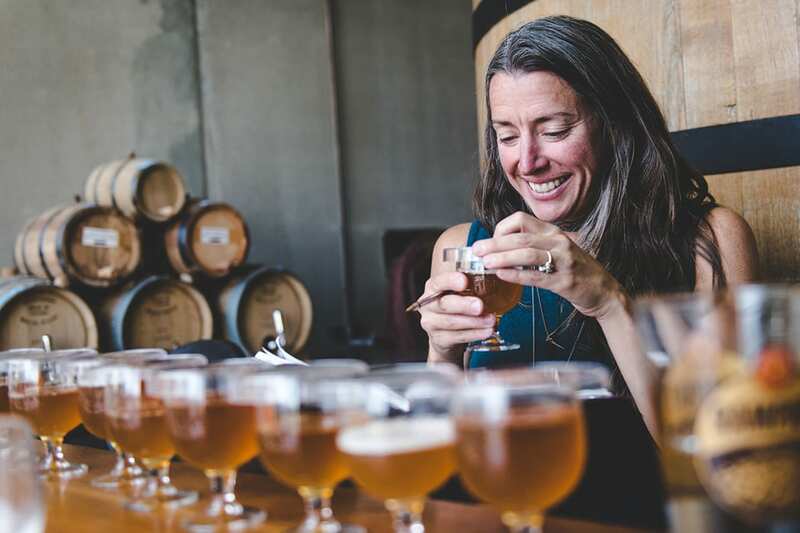 “Sours were so specific to such a small region that for hundreds of years that it was an easy to compartmentalize those two words—sour and beer—being together,” says Lauren Woods Limbach, New Belgium Brewing’s wood cellar director and blender. Now, she adds, “sour” has become a blanket term to cover any kind of beer that tastes sour, and that can be confusing. The group met at this year’s Great American Beer Festival, and they will continue the conversation as time goes on. Meanwhile, drinkers looking to fully understand what constitutes a sour beer can look to where it all started: the German and Belgian beers that launched the “sour” category as it stands today. To make sense of it all, we asked Woods Limbach to walk us through these historic styles. Brewed in and around Brussels, lambics are made with a substantial percentage of unmalted wheat and aged hops. These beers undergo spontaneous fermentation, which means the wort is left open to the air so natural and wild yeasts inoculate the batch instead of yeasts selected by the brewers. This creates a pleasing funky quality in addition to the typical “sour-ness.” Young Lambic, Gueuze and Fruit Lambics are also variations of the traditional Lambic. “Light and refreshing and notoriously low in alcohol, Berliner-Weisse are known to have a singular bright lactic, lemony flavor,” says Woods Limbach. Hailing from Germany, the beers are made with wheat (which gives them an oftentimes hazy appearance) and barley and usually spiked with Lactobacillus for the sour personality. A grab bag; an exciting and sometimes confusing land-rush where everything and anything goes. “You could spontaneously ferment your beer, take your beer and put it into a barrel to make a mixed-culture sour beer, take a beer and isolate lactobacillus, create lots of it in stainless, pitch it into a beer and have a sour. Or you could leave your beer in the lauter overnight and start to create sour,” Woods Limbach says.